Google has been giving a limited amount of lucky third-parties exclusive API access to Google+ pages, it’s opening up to other. Hootsuite is one of those lucky developers. I hadn’t tried Hootsuite before but with the new Google+ Page management integration I just had to give it a shot. I opened up the Hootsuite homepage and discovered that Hootsuite was a paid program… with a free version. The free version supports up to 5 social profiles. Now considering I have more than 5 personal social profiles that initially seemed like a drawback. Being limited to just 5 accounts made me have to consider which ones I wanted to use Hootsuite with. I decided that my main Facebook page would be the first addition and I added my personal Facebook account too with the option of removing it when I needed to add an additional profile. My excitement about using Hootsuite was based upon the fact that it could now post to Google+, or at least the pages. Away back when Google+ launched it’s brand pages I started a few companion pages for my websites. They never really took off and I was left manning un-viewed pages. In that kind of situation it’s easy to loose motivation and abandon the venture. Ever since then I’ve spent very little time on Google+ but that has just changed. I tried to add my personal Google+ account to my Hootsute account but Google have still only opened up an API with Read-Only access to personal accounts so that didn’t work. I went ahead and made a new Google+ page for my gaming website: Gaming Now and linked that too. I now have a Google+ brand page and a brilliant way of managing it easily. I could also cross post to it and the Facebook page at the same time eliminating the demotivating problem of posting to the page but nobody seeing it because I have a following over on the Gaming Now Facebook. Something that I have a hard problem doing is keeping to a decent posting regime – I post everyday, or at least most days, but I never watch the time closely enough to post right when my analysis shows to be the most engaging times. I class that as lost potential. Hootsute allows me to harness that lost potential by allowing scheduled posting to any and all of the linked profiles at any time of the day and as far into the future as I have tried – you can even attach pics and other files but I discovered a small issue with uploading files using the client. I stumbled across a certain issue when trying to upload photos in Hootsuite. I kept trying but every time I click on “attach file” I was presented with a dialogue box saying “Please select an Owly profile before uploading”. 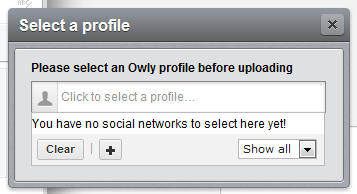 I couldn’t find a way of adding an Owly profile to Hootsuite. I thought my actual Hootsuite account was my Owly profile but apparently not so I visited the Hootsuite homepage and tried to figure out how to create an account. I couldn’t figure it out, it was like there was no such thing but I did figure it out eventually. Link a Twitter account and your good to go. A nice easy fix. So long as you keep a Twitter account linked you won’t be see that dialogue window ever again. It’s pretty awesome, I’m so glad that I now use it. It’s made things so much easier having all my main profiles in the one place. I’ll be doing a full review of Hootsute tomorrow so check back if you have the chance.